Sick and tired of boring stir fry and chicken salads? Running out of inspiration for tonight's dinner? Have a dinner party coming up and no idea what to make? Well we have the perfect solution for all your dilemmas (well, for UK peeps at least)....Flavour Full Stop Boxes of course!! Flavour Full Stop is a new brand with the aim to create new and exciting food experiences into everyone's home each month...and that they really do! A huge part of the concept that we loved was the fact each box is a surprise to the subscriber, it is only when you receive your package that you will find out the contents! Each box contains 6 full sized artisan products (both food and drink) all sourced from around the UK. 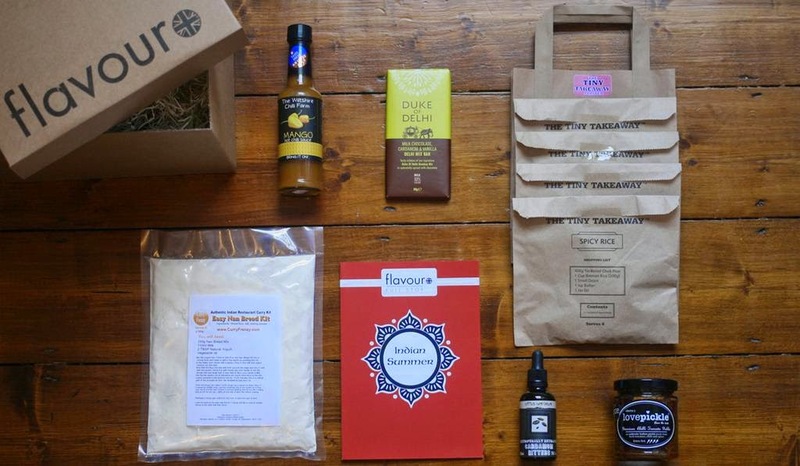 The lovely people behind the brand contacted us after reading the blog and sensing our love for food, kindly sent us a September box to trial, which was themed Indian Summer. Last weekend I was feeling under the weather so we decided to stay in and cook up a storm at London Towers and put our box to good use! Easy Naan Bread Kit - a pre weighed and mixed bag of ingredients to make the perfect naan bread! Cardamom Bitters - the perfect addition to make a mean martini! Cardamom and Vanilla Chocolate - obviously every banquet needs a pudding...! The Indian Summer box was right up our street - firstly we've all been eating curry since we were teeny tiny and were brought up understanding that it was a special treat (to this day we still get super excited about the prospect) so, points were immediately awarded for the fab theme! Secondly, the whole concept is so much fun as you've no idea what's in the box, so get the excitement of a present-like package plus the challenge to take on new things we'd probably never have attempted otherwise (hello making naan breads!). Best of all, Flavour Full Stop make everything so easy that even a complete novice could cope! The result - AMAZING...the flavours were crazily good, it felt like we should have slaved over a stove for hours to create such delicious dishes! We really felt that we'd stretched ourselves and learnt new things and it totally opens your eyes to how easy cooking outside of the box can be...we'll definitely think twice before ordering a greasy, sub-standard takeaway curry again! You've still got time to sign-up for the October box here and if you're not convinced just yet why not try for yourself? The subscription allows you to pick from a 1 month, 3 month or 6 month option...go on, DO IT!! !